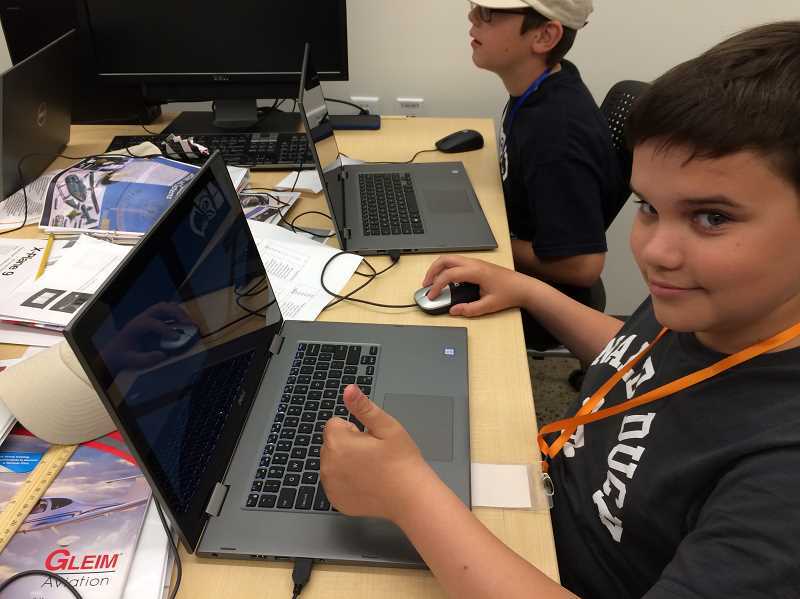 Seventeen middle school students spent a week at the Canby Public Library to learn about aviation and science, technology, engineering, art and math (STEAM). 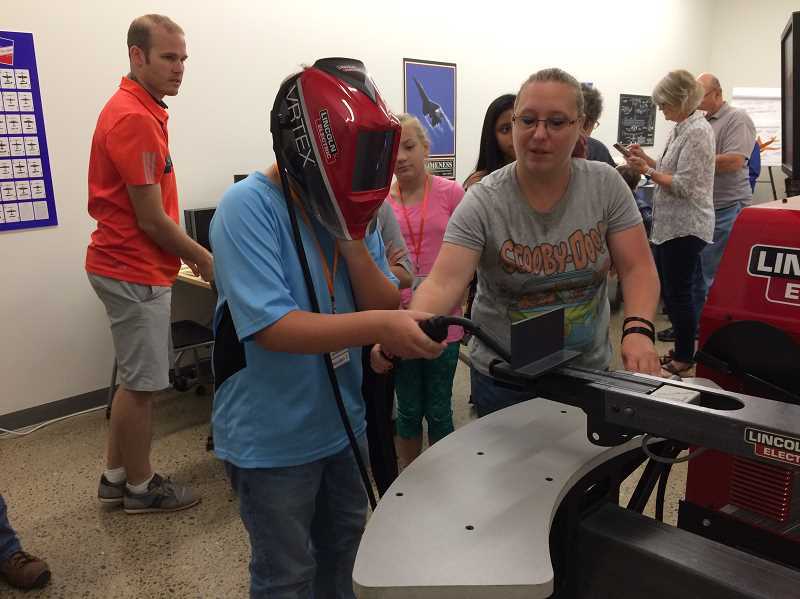 The sixth, seventh and eighth graders got to learn about aviation and engineering by taking part in the five-day program. Pilots, teachers from Clackamas Community College, engineers and cockpit instrument makers, volunteered to work with the students all week and it looked like they were having a great time. Some were working on computer simulators learning to fly planes without crashing. Although some did crash, and got up and tried it again. While some flew, others were learning how to do gas medal arc welding—also a simulation—from Marlena Tizo and Aschlie Town, two teachers at Clackamas Community College. At the same time Lydia Hesse, Hayden Taylor, Erica Mendoza and Carlos Perez talked with Joel Owens, a pilot who works for a company flying its employees all over the country. He explained to the students that he gets to work eight hours and then must take a break to ensure he is fit to fly again. The free program is the idea of Nancy Sebastion, a board member of Canby Public Library Foundation who decided she needed to fill up rooms and spaces that weren't being used at the library. She has a fondness for middle school students, suggests they lap up this type of information and decided to hold the first program for them. It combines learning about the aspects of aviation together with the interesting factors that make planes and make them fly. "Their ages make the program easy for parents and kids. Of course some parents may be working, but at this age they are able to walk or bike to the library on their own," Nancy said. The program is funded by Corey and Stacy Lohman. He's the president of Emerick Construction, they made a sizable donation to purchase the computers that are being used. Other volunteers are helping with the students. For example, Becky Breckenridge is an aviation Master pilot who has built her own plane from scratch. "She learned how to weld by taking a class at Clackamas Community College," said Sebastion. Jenny and Ron Hickman also are helping. Their company buildings advanced flight systems, or in English, they design and manufacture cockpit instruments. Shawn McGinnis and Randy Prakken are software engineers and the latter has his own plane. Other volunteers include Sebastion and Jenny Hickman. The kids are not without freebies. They all received caps donated by T-Line and get snacks every afternoon. This isn't the end of the programs. Once the week is over these types of programs will continue. One begins in October allowing middle schoolers to learn how to program computers and write code two nights a month for at least an hour. Another October program, possibly on Saturdays, is a field trip or activity associated with aviation. And, there's one planned to begin in 2019, which will be a math club meeting once per month. The beauty of all these programs is they are free to the students and have volunteers who are willing to give their time and help for the kids to grow their STEAM learning.